The Cumberland & Dumfriesshire Farmers Mart P.L.C. had forward 58 prime cattle, 5 young bulls, 24 over thirty month cattle, 4,013 prime lambs and 4,657 cast ewes & rams at their weekly sale at Longtown on Thursday 22nd July, 2010. Lightweight clean cattle were short of requirements. British Blue heifers sold to 187.5p from J. Retson & Son, Gardrum to W. Kirkup & son, Butcher; Limousin 173.5p Gardrum. Heavyweight Limousin bullocks to 163.5p Dashwellgreen. Black & White bulls to 118.5p Jerriestown, with Limousin bulls from the same to 125.5p. OTM cattle were still in demand with more Black & White cows on offer which saw all classes selling to a respectable trade. Top price of 111.5p (twice) for a Limousin cow from J.W. Coulthard & Son, Brisco Hill and a Shorthorn cow from I.H.G. Warden, Skelfhill. Other Shorthorn 107.5p Skelfhill; Limousin 95.5p Tinnis Hall and Hardhurst, 92.5p Tinnis Hall and Greystoke, 87.5p Wyseby Hill; Angus 86.5p Girnwood; Friesian 86.5p Roanstree, 83.5p, 82.5p Dockray Hall, 71.5p Harelawhole. Limousin steers to 109.5p Burnside; British Blue 107.5p Burnside. Limousin cows to £679.88 per head from Greystoke, £601.65 Tinnis Hall; Shorthorn £666.50, £635.55 Skelfhill; Friesian £589.88 Dockray Hall, £583.88 Roanstree. The 4,013 prime lambs were the largest show of the season thus far. 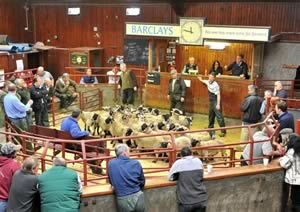 A larger ring of buyers were in attendance and hungry for sheep, leading to a sale average of 169.5p per kilo. All types were easy to sell and a good show of export types were present. Top price per kilo of 197p for Beltex’s from Ormiston and to £90.80 per head for Texels from Willimoteswick, others £88.80, £86.80 Burnside; Suffolk £85.50 Swainsteads, £83.80 Upper Mains, £82.80 Barnglies; Beltex £82.80, £74.20 Mouldy Hills; Charollais £79.80 Quarryfield, £75.80 High House; Greyface £73.80 Midtodhills, £72.20 Drumcork; Half Bred £73.20 Dodgsonstown, £70.20 Earlside; Oxford £68.80 Guards, £66.50 Midtodholes; Cheviot Mule £65.80 Low Rough Hill, £64.80 Terrona; Blackface £64.50 Penpeugh, £57.80 Butterdales; Leicester £63.80 Morley Hill; Lleyn £62.80 Nirvana; Dorset £61.80 Butterdales. The 788 light weight lambs sold to a top of £68.80 for Beltex from Ormiston; Texel £64.80 Catslackburn, £64 Stonehouse, £63.20 Edges Green; Suffolk £59.80 Newington, £58.20 Whitstonehill; Hill Cheviot £57.50 Commonside; Blackface £57.80 Penpeugh; Greyface £56.80 Whitedyke, £54.80 High House; Charollais £52.80 Smithy Court; Swaledale £50 Laalsteins and Kirkland Green. An excellent show of 4,657 cast ewes and rams was forward to a larger ring of buyers, which saw a very good trade for all classes, and all classes being sharper on the week. Top price achieved was £158.50 for a Charollais tup from Severs; Leicester £133.50 Upper Hindhope and Morley Hill, £96.50 Morley Hill; Texel £133.50 Longyester, £128.50 Wester Dunnet; Suffolk £118.50 Aimshaugh; North Country Cheviot £116.50 Wester Dunnet; Beltex £94.50 Tercrosset; Hill Cheviot £80 Upper Hindhope; Blackface £66.50 Milnmark and Upper Hindhope; Swaledale £54.50 Aimshaugh. Heavy ewes to £138.50 for Texels from Paulsland, others £130.50 Oldfield, £122.50 Severs; Suffolk £128.50 Stackbraes, £123.50 Little Orton; Leicester £123.50 Roxburghmill, £118.50 Stackbraes, £110.50 Upper Hindhope; Bleu d’Maine £114.50, £102.50 Whitehill Cottage; Beltex £99.50 Tercrosset, £92.50 Wester Dunnet; Cheviot Mule £96.50, £92.50, £87.50 Sibmister; North Country Cheviot £94.50 Wester Dunnet, £93.50 Stackbraes, £84.50 Timpendean; Half Bred £90.50 Patties Hill and West Farm, £82.50 Newington; Charollais £88.50 The Wreay; Greyface £84.50 Muirhead and Bally Quillan, £79.50 Hartside; Zwartbles £70.50 Hillside. Hill ewes to £78.50 Coytre, £68.50 Whins, £64.50 Upper Hindhope; Blackface £68.50 Butterdales and Longyester, £64.50 Culquhasen; Lleyn £58.50 High House; Swaledale £56.50 Burn House, £54.50 Kirkland Green and Miller Hill; Jacob £48.50 Alton; Herdwick £36.50 Hayclose, £35.50 Mossband House.